In actuality, the origin of today’s feast isn’t too off from that story. The Feast of Christ the King (originally the feast was called the Kingship of Christ) was established by Pope Pius XI in 1925 with his encyclical Quas Primas. The context of this action is important. Three years earlier, Benito Mussolini had marched with 30,000 fascist followers to demand the resignation of the Italian Prime Minister. Mussolini succeeded and by 1925 established his power as a true dictator and Il Duce - the Leader. That same year, Pius XI reminded the Church, and especially Italians, who the true leader was, is, and shall always be. The reminder is still important today. In this life, many people will claim to be the the Leader. But with great joy and consolation we know there is only one King. If you have not turned in your pledge card, please bring them this Sunday or Sunday, December 2. Sunday we celebrate Christ’s kingship when he comes again at the end of time. Next week is the beginning of the season of Advent when we imagine what it was like to await the first coming of the Messiah. Meanwhile we prepare to celebrate the birth of the Baby Jesus at Christmas. Messiah, Baby Jesus, Jesus Christ, King Jesus - Jesus has a lot of names! When you pray, to whom do you address your prayers? What name do you use for God? The prophet Isaiah had lots of names for the longed-for Messiah. Some of them are best known to us from Handel’s oratorio: Wonderful Counselor, Prince of Peace. We sing others each year when we sing the hymn “O come, O come, Emmanuel”: Wisdom from on high, Lord of might, Branch of Jesse’s tree, Key of David, Dayspring, Desire of nations, Emmanuel. Why are there so many names? For the Hebrew people in Old Testament times, a name conveyed an essential characteristic of the person being named. How could we possibly begin to name the Messiah? Is one of these characteristics more essential than the others? Which one of these characteristics of the Messiah is most important to you? This year, our service of Advent Lessons and Carols will explore these names for the Messiah which have been collected in the “O Antiphons.” These antiphons have been used at the Eucharist and Evening Prayer from December 17-23 since about the 8th century. The lessons and carols will demonstrate how each of the characteristics of the Messiah mentioned in the O Antiphons was fulfilled in Jesus. Please join us next Sunday, December 2 at 5:00 pm for Advent Lessons and Carols. Join with Isaiah as he pleads, “O come, O come, Emmanuel.” Join us in singing the “O Antiphons.” And, as we sing in “At the name of Jesus” - Hymn 435 - this morning, let your hearts enthrone him. As I prepare for hosting my family for Thanksgiving dinner on Thursday thoughts of “Why am I doing this?” keep popping into my mind. My answer to myself is that it provides an opportunity for our family to be together, it enriches my life, it creates a feeling of satisfaction, and it is done out of love. I can give very similar reasons to answer the question “Why do I give?”. St. Timothy’s is my family and God is in the center of it and giving does indeed enrich my life. Giving helps the programs of the church continue and thus provides opportunities for me to be among my church family. Giving provides me not only with the satisfaction of doing what I know God expects, but also with the sense of freedom that came when I began to view giving as a vital part of my life and not an obligation. And finally, I give out of love. Nothing, absolutely nothing, surpasses the love God has for all of us and giving is one tangible way I can acknowledge that love. As we all prepare for Thanksgiving, may we be ever mindful of the blessings in our lives. If you have not yet determined your financial gift for 2019, please take a few moments from your busy Thanksgiving schedule and prayerfully consider “How”, “What”, and “Why” you are called to give. At the start of the year, as Finance Commission and vestry were working together to form the 2018 budget, we shared with you that expected income (based on pledges received) vs. expected expenses forecast a significant deficit for the year ($75k). I would like to provide an update on our current financial standing through October of 2018. Through October, expenses have exceeded giving resulting in a year to date deficit of $56k. It is our goal every year to break even, but it is not uncommon to have a deficit with a few months remaining. Historically, we have experienced generous giving during the last few months of the year, and hope to experience the same this year so we can close the gap. Please make sure that your pledge is up to date, and prayerfully consider helping us finish the year strong. If you have not yet pledged for 2019, please consider doing so! St. Timothy’s relies entirely on your generosity to deliver the wonderful programs we have become accustomed to. 2019 pledges will be a primary driver of our budget, and the sooner they are received the more accurately we can plan for the year. Thank you for your generosity and commitment to St. Timothy’s, and for your help in keeping us on solid financial ground. I have heard concerns about contribution checks that have yet to clear the bank. I wanted to put your minds at ease on the subject. St. Timothy’s processes all checks received via remote deposit. The checks are stamped for deposit only and then run through a scanner and deposited through a secure portal with the bank. This provides for a rapid deposit and leaves us with the physical backup of the check to reference whenever the church or a parishioner has a question about a check payment. A transfer to a new bank and unanticipated technical difficulties related to it have made us temporarily unable to utilize remote deposit for the checks we receive. Checks had been entered in our contributions software and then stored in hopes of a quick resolution to our remote deposit woes, but we are still working on it. All donations received via check through 11-18-2018 have been physically deposited at the bank. If you have delivered a check contribution to St. Timothy’s through that date and it does not clear your bank by next Tuesday morning, please contact me so that I can investigate further. We apologize for any inconvenience the situation has caused. 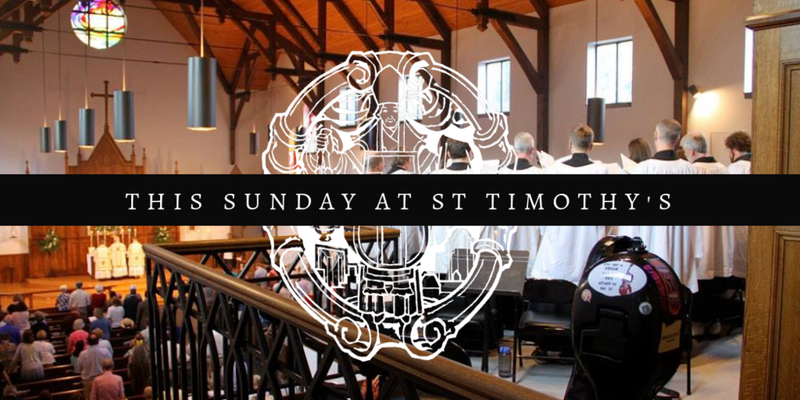 Thank you for your faithful and vital support of the life of St. Timothy’s and its ministries.